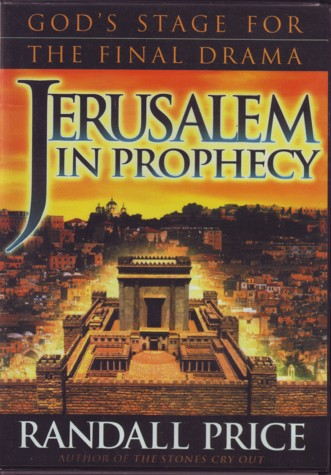 I am currently reading a book called Jerusalem In Prophecy by Randall Price. He is making the case for Jerusalem’s centrality to God’s unfolding plan of salvation. Thus far he has been providing somewhat of an apologetic against theological perspectives that negate physical Jerusalem as a place of significance in God’s end time scenario. I just started into the ‘meat’ of the book wherein Price begins to develop why Jerusalem is a special place in God’s “economy.” Price is a classic or revised dispensationalist (vs. my Progressive Dispensationalism), thus he sees the Davidic kingdom (cf. II Sam. 7) only being realized in the future in physical Jerusalem on David’s throne in the millennial temple (yet to built cf. Ez. 40–48). Consequently he places alot of weight on physical Jerusalem. So far, the only thing that has really bothered me is some of his belief that the kingdom isn’t currently being realized ‘now’; but more than that, he places so much significance upon physical Jerusalem in history, that he minimizes the significance of the New Jerusalem spoken of in Revelation 21–22. If anything, it should be the reverse, so that any significance that physical Jerusalem does have it should be viewed from its eschatological point. In other words, Jerusalem in the millennium will finally give way to its ultimate telos or purpose, as will all of creation, as we transition from the millennium to the eternal state or the New Heavens and New Earth, the heavenly Zion or Jerusalem. Having said this, I agree with Price’s general premise, and that is that Israel and Jerusalem have tons of significance in God’s unfolding plan in salvation history; and that Jerusalem should have significance for the Christian, not only because of her past, but because of how the future in breaks upon that past and present filling it with a special sense by God’s choosing (see Deut. 7; Jer. 31ff; etc.). I would recommend this book, even if you disagree with the premise and approach; it is exciting to think that God is working even until now!